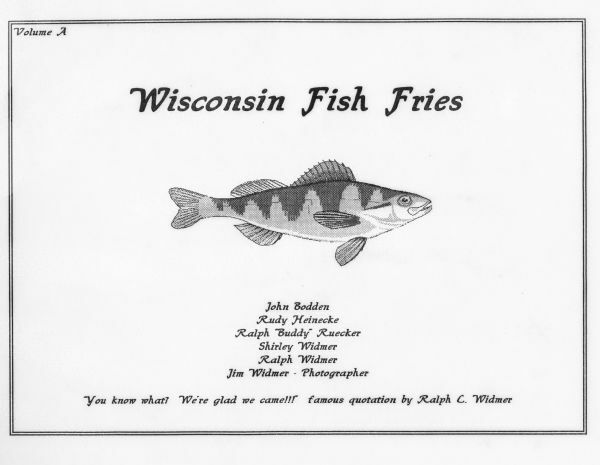 The cover of Volume A of the Widmer's fish fry collection with the drawing of a yellow perch. The quote at the bottom reads "You know what? We're glad we came!!!" by Ralph C. Widmer. The inner cover reads, "One of the great traditions native to the state of Wisconsin in the "Famous Friday Night Fish Fry." When traveling in other states, one notes the lack of that venerable tradition. In the early 1990s, Ralph, Shirley, and Jim Widmer invited neighbor, Oscar Bodden, to a weekly Fish Fry. Later on, Rudy Heinecke and Ralph Ruecker joined to make it a sixsome. Occasionally, other guests are invited. When Oscar Bodden passed away unexpectedly, his brother, John Bodden, filled the void. In August, 1997, it was decided to take a photo with some identifiable sign in front of each establishment, as well as taking a picture seated at the table, preferably with our waitress, or waiter, in the photo. Also at this time, Shirley Widmer prepared a long list of potential fish fry locations. Each member, in alphabetical order, and referring to Shirley's list, chooses where the group will dine. In April, 1998, we began voting on the overall quality, service etc. The system rates it on a 1- to 5-star basis, and an average is determined." Loaned for scanning by Jim Widmer. Part of the series of photographs taken by Jim Widmer of fish fries in Wisconsin.